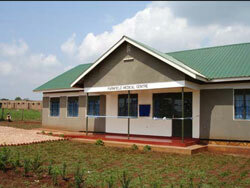 On 3rd August 2005 the Farnfield Medical Centre was officially opened by Hon. 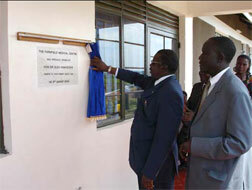 Dr Alex Kamugisha, the Minister of State for Primary Health Care. The project is aimed at providing medical facilities for both staff and students at Lords Meade Vocational College as well as the local community. • 10 bed sickbays for both male & female students, as well as smaller units for staff members. The Farnfield Medical Centre will assist the community of Bukaya by providing quality medical services at an affordable cost. Funds for the project were raised by Daniel Farnfield – who worked at Lords Meade Vocational College for 8 months in 2003 as a volunteer in his GAP year – and his mother Vanessa Farnfield in England. Both the Tofta Educational Trust and Lords Meade Vocational College deeply appreciate Vanessa and Dan Farnfield’s time, work and generosity that has produced the Medical Centre. 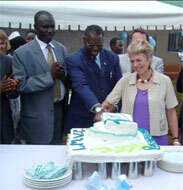 Vanessa Farnfield and Hon Dr. Alex Kamugisha (centre) cut the cake at the official opening of the Farnfield Medical Centre.